MaxOne is a Responsive, Retina-Ready One-page WordPress theme with a minimalist, simple, elegant and clean style, a strong focus on contents and readability. It presents a modern business solution. MaxOne is suitable for multipurpose websites such as business, company, portfolio or blog. It is superbly responsive adapting to any kinds of smart phones and mobile devices. Code is easy to modify and understand so you can personalize it in the easiest way. MaxOne is fully integrated with the visual composer. This awesome page builder lets you to create complex layouts of your pages and posts with simple drag-n-drop interface. You can create easily any page layout using extended Visual Composer and our flexible shortcodes. Multipurpose One page WordPress Template. Parallax Effect Backgrounds – maxone supports parallax backgrounds depending on cursor movement. You can easuly add parallax backgrounds to every page sections. 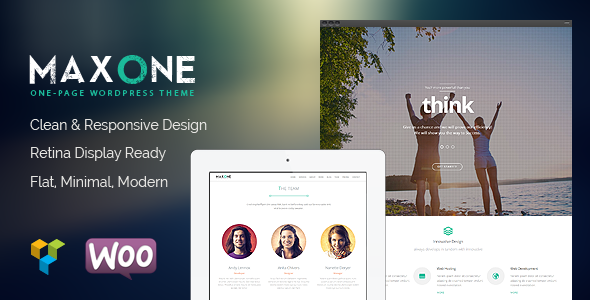 Item Reviewed: Maxone Creative One Page Multipurpose Theme 9 out of 10 based on 10 ratings. 9 user reviews.